Underground storage tanks must be removed by a Licensed Petroleum Contractor holding a PM2 license. Individuals holding a PM2 license are trained and certified to remove underground tanks and comply with all safety regulations. An environmental assessment must be performed once the tank is removed or if a tank owner is applying for a variance to leave the tank in place. To better understand your options and responsibilities as a tank owner, consult a Licensed Petroleum Contractor. They will explain the tank removal process and ensure the work is done in compliance of all applicable regulations. Old, underground tanks are very likely to leak. Oil leaking from underground tanks will contaminate soil and groundwater and result in expensive environmental clean-up costs! Underground tanks are required to be upgraded with specific leak and spill prevention equipment or removed. 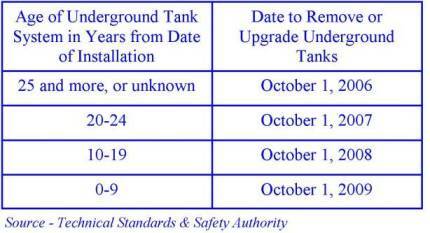 Upgrading requirements for underground tanks depend on the age of the tank (see table below). Underground tanks that are 25 years and older, or of an unknown age, and not specially protected from corrosion are required to be removed by October 1, 2006. Underground tanks with a storage capacity greater than 5 000 litres will need to be leak tested annually. Unused underground tanks are required to be removed and any contamination cleaned. *The Technical Standards and Safety Authority (TSSA) is an independent, not-for-profit organization responsible for the delivery of a range of safety services. This includes the administration of Ontario’s Technical Standards & Safety Act, 2000 within various industry sectors and the delivery of safety programs to the public. For inquiries, please visit our website at www.tssa.org or call our toll-free line 1-877-682-TSSA (8772).